A visit or two or three or more to Menya Noodle Bar, Chinatown. Menya Noodle Bar is the older brother of the uber popular Menya Mappen. This subterranean bunker is small but bright and cheery, a great place for a pair of ramen junkies to get a fix. After our first trip to Japan we had an idea of what the perfect ramen was. But after a second trip to Japan, as well as eating ramen all over Sydney and elsewhere, we've come to the conclusion that's there's no such thing as the perfect ramen. Every ramen is different and ever ramen eater has their own opinion. That's the joy of it. Shawn reckons he's an innerwest broadminded pinko lefty type, but when it comes to ramen he's as conservative as Pauline Hanson, he loves his tonkotsu plain and simple - tonkotsu shoyu - $9.30. 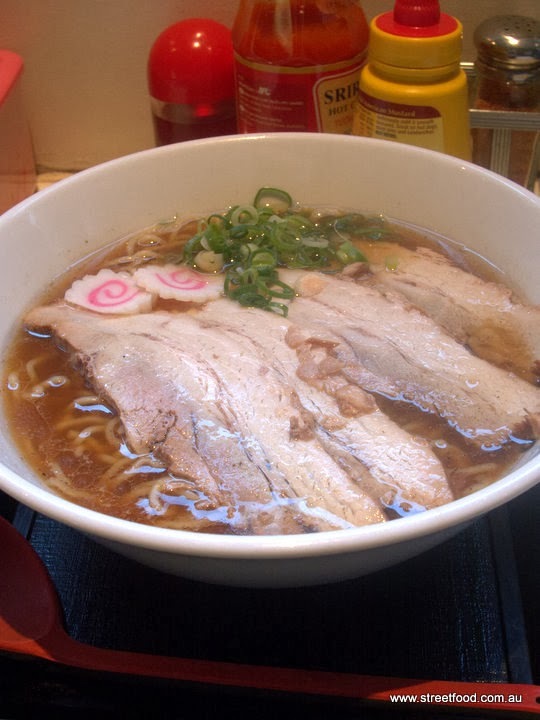 Alison is the Lady Gaga of ramen, she'll try anything, such as the kogashi ninniku tonkotsu shoyu ramen ($11.30). This is truly amazing - it tastes of roasted garlic, lots of roasted garlic. The flavour is deliciously intense. Mr Shawn accidentally orders a spicy chili ramen, it's a happy accident. This is the karami ramen (chili pork mince) tori-gara shoyu - $11.90. This one is for chili lovers, it packs a bit of heat, not killer hot but on the way, the oil slick in the soup adds to the heat. The noodles are superb, thin with the perfect amount of chew. Excellent. Ton-toro ramen (roasted pork) with tori-gara shoyu broth - $11.90. A chicken broth flavoured with soy and topped with four killer slices of roast pork. The broth is nice and chicken-y and plain for a ramen - the more ramen we eat the more we like the simpler ones. Ton-toro (roasted pork) ramen with tori-gara miso broth - $12.90. Same as above - chicken broth with some lovely pork slices, with a dollop of miso added to make it richer. It's a fairly rich miso ramen but not super rich. Pretty good! Tori katsu (chicken schnitzel) ramen - with tori gara miso broth - $11.90. Chicken broth enriched with miso with a chicken katsu on top. The fried chook schnitzel is great but goes soggy and loses flavour in the soup. Hakata ramen - $10. A light, thin pork broth with thin noodles. Happy. Pork sausages with cheese - $3. A wonder of manufactured meat, little porky franks with a hint of cheese. These were far nicer than they should be, they had a nice bite to them too. 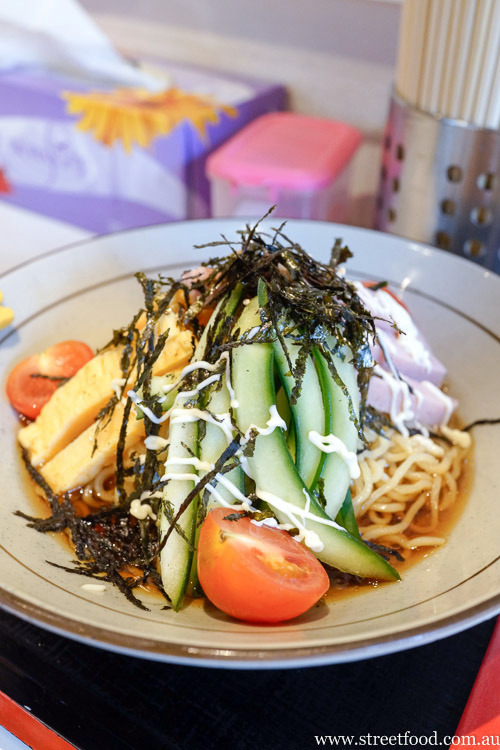 Hiyashi chuka - $11.90. Cool, toothsome ramen in a cold sweet broth with a light sesame kick, topped with vegies, some Devon-like manufactured mystery meat, some lovely sweet omelette, mayo and seaweed sprinkles. A perfect lunch on a hot day. It's the Japanese equivalent of a cold meat and salad lunch at our parent's place. Hiyashi zaru soba - $11.90. 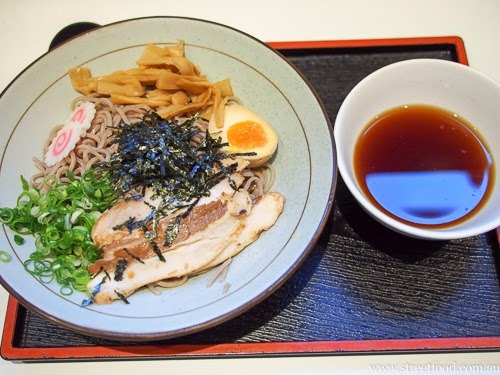 Cold buckwheat soba noodles with cold dunky sauce. The fatty pork slices are amazing, so rich and extra flavourful served cold. Menya Noodle Bar is at Shop TG8, 8 Quay Street, Haymarket NSW 2000. Phone 02 9212 1020. I've walked past here a couple of times and have always wanted to try it out :) Now I'll definitely have to eat here some day- the kogashi ninniku tonkotsu shoyu ramen sounds so good! The little rice bowl looks wonderful. Great value too!